To ensure optimum performance, your IUanyWare profile is reset at the end of each academic year (between summer and fall); for details, see About the IUanyWare user profile reset. Any files stored in the IUanyWare Documents library may be lost at the end of your IUanyWare session. If your local device (computer, notebook, tablet/smartphone, thin client) has available local storage (hard disk, CD/DVD, thumb drive), you may store your files locally. The IU Cloud Storage service permits you to specify which of several popular cloud storage services, such as Box at IU, to make available at all times to your IUanyWare session. You may also specify other IU file shares as a storage option; see About the IU Cloud Storage Portal. The IU Box service provides a simple, secure way to share and store files and folders online. Box consolidates your content in a single location, easily accessible from anywhere, on any device. You can create files and folders, share them using a direct link, invite others to collaborate, and continue to revise and review your content. Though similar in appearance to other consumer services such as Dropbox, Box is approved for IU data and can directly integrate with existing IU systems (for example, accounts, CAS), security, and contractual protections. Your Box account quota is unlimited. Your Box account supports advanced collaboration features. For more, see About Box at IU. Opening and saving your files with an IUanyWare application is similar to opening and saving your files with an application installed on your local computer. To open a file: From the File menu, select New to create a new file, or Open... to open an existing file. You may not be able to open an IUanyWare application by double-clicking an existing file. To save a file: From the File menu, select Save... to save an existing file, or Save As... to save a newly created file. You can save your files to the Cloud Storage service, or locally to your computer (or, in some cases, to your mobile device). However, you cannot store your files in IUanyWare; see the warning above. The instructions below only apply if you are running Citrix Workspace app (formerly known as Citrix Receiver) for Windows or Mac. If you are using the web Receiver (the "light version"), to switch to the Workspace app, see Switch between Citrix Workspace app and web Receiver. From the left side of the pop-up window, click + (the plus sign) next to "Computer" to expand it. This will give you access to each of the disk drives on your client device (for example, Local Disk (C: on ...), CD/DVD Drive (D: on ...), etc.). From the Client Viewer menu bar, select Preferences..., then File Access, and then Read and write. Click the Devices tab. If they are not already selected, check the boxes for both When a session starts, connect devices automatically and When a new device is connected while a session is running, connect the device automatically. The storage location C$ (\\Client) should now be available in your list of "Computer" storage locations. You may also configure settings for removable media on your local workstation. These settings will remain in place until you change them. Local Disk (C: on...) takes you to the Macintosh HD directory. Local Disk (H: on...) takes you directly to the home directory of your user account. From the system tray on your computer (lower right corner), right-click the Citrix Workspace icon and click Connection Center. Navigate to the File Access tab, and verify that "Read and write" access is selected. 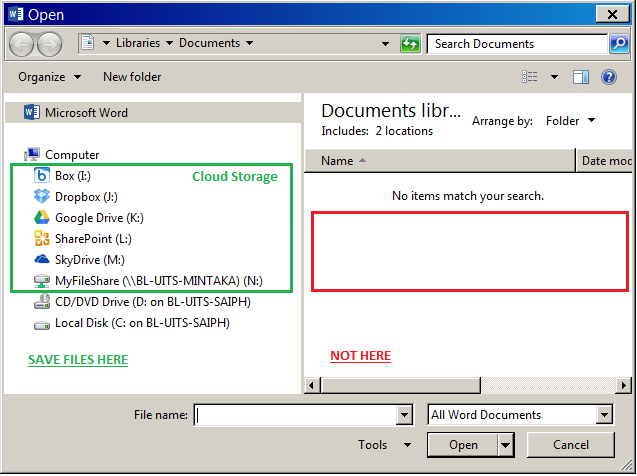 Select a drive letter or + (the plus sign) next to the drive letter to select the destination folder of your choice. Mac: "How do you want to access files on the mapped drive [X] from this application?" Windows: "An online application is attempting to access files on your computer." Select Read & Write access (Mac) or Permit all access (Windows). To avoid seeing this message again, check Don't ask me again before proceeding. The drive or folder will open, and you can select the name of the file you want to open or save. If you wish to map a drive to save your files to a location other than your local computer (but not IU Cloud Storage), from within your IUanyWare session, right-click Computer and select Map network drive.... For more, see Map a drive (access a shared resource) at IU. This is document bbcl in the Knowledge Base. Last modified on 2019-01-10 14:26:31.